Resolutions, goals, dreams, plans mean little. It's who we are and what we do that really matters. More sparkenations here where you can also download all 52 of 2014's sparkenations in the one ebook. 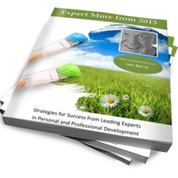 The ebook Expect More From 2015 contains ideas from 24 experts. Please download the full ebook with my compliments here. My contribution offers you a complimentary high value briefing. It just might be the catalyst for you being and doing who and what you must to ensure this year gets off to the start that you need and want. Remarkable is the new normal 7 part webinar series online 4.10 – 4.50 pm Australian Eastern Daylight Savings Time February 2nd, 9th, 16th and 23rd, and March 2nd, 9th, and 16th 2015. The authors of this blog are all members of differencemakers community a participatory third place for people worldwide who are changing what needs to be changed and looking to increase the scale of their differencemaking. Are You Ready for a More Fluid Workforce? What is the Quality of Your Actions? My 1000th blog post. So What? What's written on your heart?